The Apostle Islands were named by early French Missionaries who mistakenly thought there were 12 islands (there are 22). 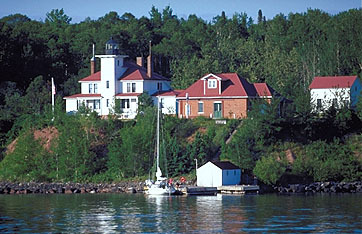 The islands today form the Apostle Islands National Lakeshore and feature a collection of unique lighthouses. 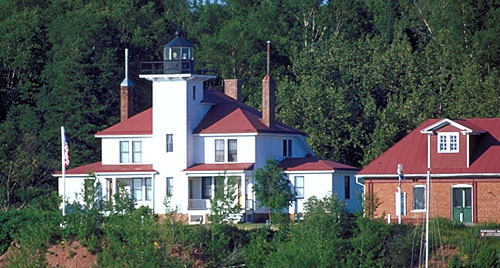 The white clapboard lighthouse at Raspberry Island was constructed in 1863 and fitted with a fifth-order lens. The red brick structure was added in 1902 to house a fog signal. In 1957 the Coast Guard placed a solar-powered optic on top of a steel pole, ending the original light's service. Raspberry Island can be visited June-August (715-779-3397).